Sponge divers, spanakopita and the annual Epiphany celebration have long added to Tampa Bay's charm, but now the historic Greektown district is getting federal recognition. The National Park Service has listed the district on its National register of Historic Places as a traditional cultural property, which is a first for Florida. 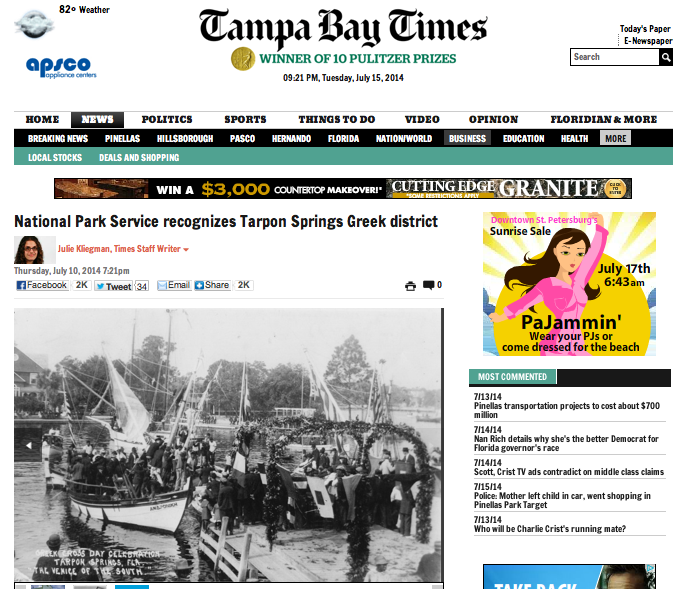 "The Tarpon Springs community has functioned as a center of commerce and trade for early Greek immigrants since the 1900s," Florida Secretary of State Ken Detzner said in a news release. The 140-acre area, first populated by Greek immigrants in 1905, is home to hundreds of residential and commercial buildings and about a dozen sponge boats.